Whenever I hear the words "popup camper," I think of a "jack in the box" similar to one I had as a child where you wind a crank, a lid pops open, and whatever figure is inside pops out. Although a popup camper, also commonly called a tent camper or folding camper, isn't quite that easy to set up, the theory behind it is similar. A person uses either a hand crank or hydraulic lift to open and lift up the top portion of the camper, the beds on the ends are slid out, and any other slides included on the camper are slid out, and a person is well on their way to getting their camper set up. But, as the owner of a popup camper for six years, setting up the camper or taking down the camper in inclement weather, such as a driving rain, is no fun. But aside from the negatives of the time it takes to set up and take down a popup/tent/folding camper, they have a lot of positives that make them an attractive camper to buy, especially for first time buyers. They are reasonably priced. Pop-up campers are the most reasonably priced category of towable camper which makes them a very popular purchase for first time camper buyers as well as for families who love to camp but have to watch their budget. Because almost all pop-up campers have canvas or "soft sides," they weigh less than any other category of camper which means a truck with a large towing capacity isn't needed to tow the camper. Many vans and SUV's are more than capable of towing a popup camper to any destination. Pop-up campers have a low towing profile which makes towing them almost effortless. There is no need for special side view mirrors because a folded down pop-up camper does not obstruct the driver's view. Storage is much easier than with any other towable camper too because a folded down pop-up camper isn't too tall to fit through a garage door which means special storage isn't needed. But What are the Downsides of Pop-up Campers? Setup and takedown times can get tiresome. The person in the campsite next to you may pull in with a 5th wheel and only have to spend a few minutes leveling, anchoring, and hooking their camper up to any available amenities such as electricity and water; while you need to unfold, slide out, and crank up your pop-up camper before it's usable. Limited amenities. Because they are a soft side camper and more of an entry level camper, amenities will be limited. Although a popup camper isn't as luxurious as some of the higher end campers, they are also a lot easier on a person's pocketbook. Not so great in windy and inclement weather. If a storm comes up while you are camping in your pop-up camper, it can start to feel like you are on a scary amusement park ride because a strong wind will rock the camper and will likely cause some unwanted breezes to blow through the canvas sides. Lack of privacy. It's hard to get much privacy in a pop-up camper. Even the bathroom (not available in all pop-ups) is usually only enclosed by a curtain or a thin wall that is definitely not soundproof. The mattresses on the beds are definitely not 5 star hotel quality. Most popup campers have thin mattresses. The first few years we owned a pop-up camper we used those eggshell type mattress pads to make our beds more comfortable. After that we invested in high quality air mattresses which made sleeping in the camper much more enjoyable and restful. 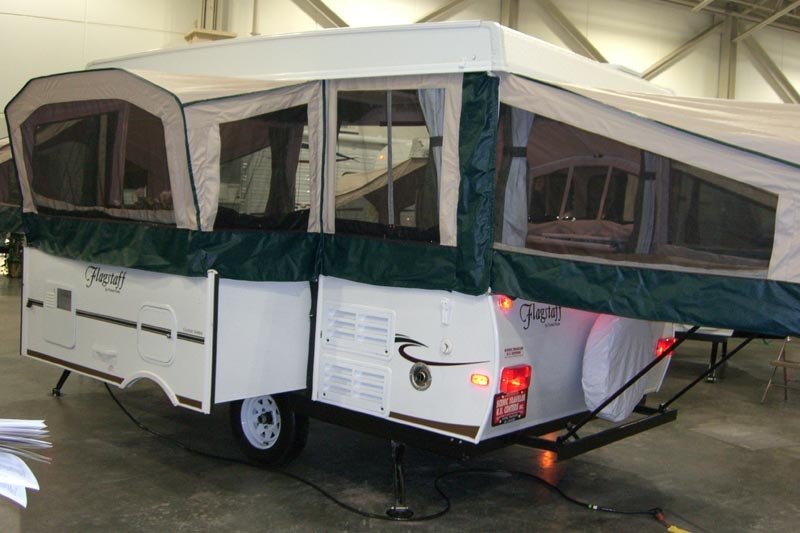 Although the upper sides of a pop-up or tent or folding camper is usually a soft sided canvas material with some sort of vinyl and screening material used for the window areas; a few manufacturers make pop-up campers where all the surfaces – even the sidewalls, are constructed from hard materials. One of the most confusing things I encountered when I first started looking for a pop-up camper to purchase was the terminology used. Although I usually refer to this type of camper as a pop-up, some people only know them as tent campers, while others have only heard them referred to as folding campers. Popup camper, pop-up camper, folding camper, tent camper, camping trailer, folding camping trailer, fold down camper and soft-side camper all refer to the same type of camper: a camper that fold down into a hard side base "box" unit of varying sizes, that has pull-out sleeping areas with tent like canvas sides on either end of the camper, along with clear plastic or vinyl coverings for the windows that often have UV protection built into them and also include flexible screening so the "windows" can be opened and closed at will. But, remember, there are a few exceptions to the rule of the camper having canvas sides. A few do have hard sides but they aren't as popular as their soft-sided counterparts because producing the hard sides drives up the cost, often making them nearly as costly as a low end towable travel trailer. 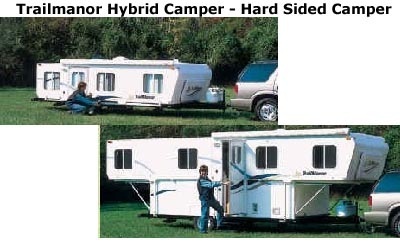 The hard side pop-up campers are often referred to as hybrid pop-up campers. Popup campers are a nice upgrade from a tent because they are more comfortable for sleeping and they provide better protection from the elements than most tents do. Most pop-up campers have heaters and air conditioning units (heaters are often standard, air conditioning units are almost always an optional piece of equipment, you can check the Carrier Air Conditioner Reviews to read more about the units that go perfect with a camper) which keeps things inside the camper cool even when outside temperatures get over 100 degrees in the summer and you are in a campsite with little shade and no breeze to help cool you off. And the heater will keep you toasty warm on cool fall nights when temperatures dip down towards freezing. The "box" part of the camper ranges from 8 to 18 feet in length. After the camper is popped up and the sleeping areas are slid out the camper can be nearly 30 feet in length depending on how big the box of the camper is and depending on what sizes beds are on each end. If that's not enough room for you, a popup camper with a slide out will give you even more space. A slide out is another part of the camper that slides out, often a dining area, that increases the interior space of the camper making them more spacious inside than some travel trailers. And, if you still looking for more space, most pop-up campers have optional screen rooms available for purchase that attach in the same area as the camper's awning, giving you another room to use while camping. Keep in mind though that a slide out and screen room will increase the setup and takedown time, along with a slide out increasing the towing weight of the camper. Depending on what brand and model of pop-up camper purchased, there are a surprising number of amenities available, although they are less fancy and luxurious than those in travel trailers, 5th wheels, and other more expensive categories of towable trailers. Our family’s first camper was a Coleman popup camper (Coleman campers were purchased by Fleetwood several years ago) and we loved it. It was easy to store, easy to tow, easy to maneuver into a campsite, easy on our pocketbook, and easy to maintain. The biggest downside to a pop-up camper is the setup and takedown time, unless you have of the A-frame models or the hybrid model manufactured by TrailManor. Those are quick and easy to set up although the A-frame models are small and TrailManor campers aren't as easy on a person's pocketbook as a traditional popup camper. There’s no getting around the fact that a folding camper involves quite a bit of setup work. After you arrive at your campsite and have your trailer parked where you want it, the camper has to be unfolded, usually with a hand crank although hydraulic lift systems are becoming popular and ease the workload. The beds then have to be slid out and the support poles outside and inside need to put in place. The door needs to be slid down from the ceiling and put in place. And the entire inside needs to be unfolded and unpacked. If you have two people working together and you get a system going, you can get your camper and campsite set up in less than an hour, which isn't all that bad. But you might get jealous if someone with a pull behind travel trailer pulls in the site next to you and you see that it only takes them about 15 minutes to get everything set up—including getting out their camp chairs and starting their campfire. Another disadvantage with a pop-up camper is inclement weather. Windy conditions may make you wonder if your camper is going to blow away like Dorothy’s house in the Wizard of Oz. Rain isn’t as bad but you need to make sure too much rain doesn’t collect on top of the canvas in the sleeping areas and collapse them. And if you have to take your camper down while the canvas is still wet, it will be necessary to open the camper back up to dry out once you get it home so that the canvas doesn't get moldy and musty smelling. Even though there are disadvantages, pop-up campers are a great choice if you don’t have a lot of money to invest in a camper. And camping is a lot of fun. My brother and sister-in-law have had their popup camper for seven years. They live in the upper Midwest which gets cold and snowy winters, yet they are able to comfortably able to use their camper from March or April through October although they do rely on their camper's furnace to help keep them warm on those chilly spring and fall evenings. Popup campers make a great choice for someone who's just getting into camping due to their lower cost and easy towing.